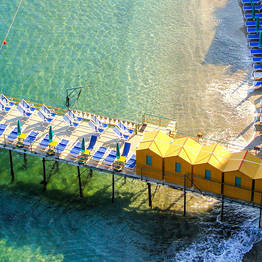 Sorrento is not part of the Amalfi Coast in a geographical sense, but instead is located on the Sorrentine Peninsula. 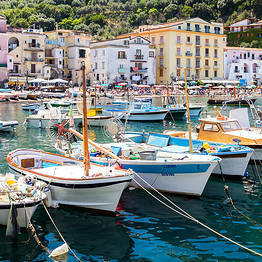 It is a popular choice to use as a base for visiting the entire surrounding coastline and nearby sights and islands because it is well connected to the Amalfi Coast, Capri, Ischia, Pompeii, and Herculaneum. 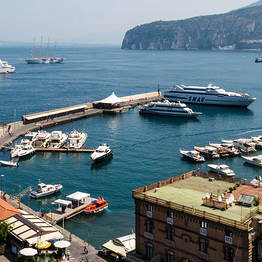 From Naples, you can reach Sorrento by using the Cirumvesuviana rail line, or by taking a ferry from the Naples port or direct bus from the airport. 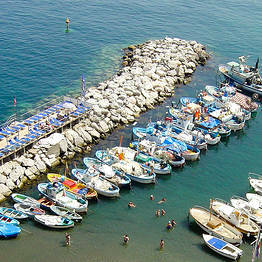 From Sorrento to the Amalfi Coast, there are public Sita buses and ferries. 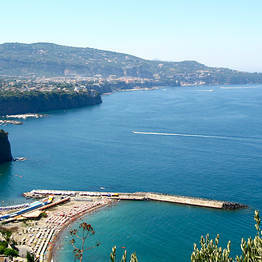 Since the elegant time of the Grand Tour, Sorrento has been one of the most popular destinations in southern Italy. With its picturesque coastal cliffs rising dramatically above the Mediterranean, its bustling town center, and its sweeping views over the water, this resort town attracts thousands of visitors each year. It is both an unforgettable town to explore and a convenient base for touring the surrounding coastline and sights. 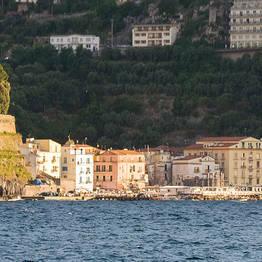 Sorrento is a town worth touring at a leisurely pace, meandering through the narrow streets of the historic center, sipping a cappuccino in the lively Piazza Tasso, and stopping to admire the spectacular sunset from the scenic over look at the public Villa Comunale park. 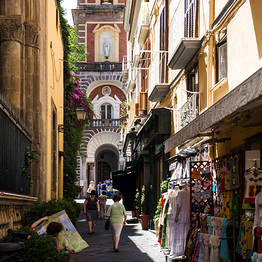 Along the lanes lined with shops and artisan workshops, you can also tour the town's monumental churches like the Cathedral and the Basilica di Sant'Antonino, historic Medieval palazzos, and the remains of the ancient defensive walls which once protected the city from attack. Museo Correale: holds the art collection of Count Terranova in the palazzo which is still the family residence. Paintings, archaeological finds, and porcelain from Capodimonte are all displayed alongside the original furnishings dating from 1700. Museo della Tarsia Lignea: the art of inlaid wood is on of the most traditional on the Sorrentine Peninsula, and you can admire a number of breathtaking examples of this local craft in this collection. Villa Fiorentino: in the halls of this villa dating from the 1930's, the Fondazione Sorrento organizes modern art exhibitions and thematic shows dedicated to local artisan crafts. 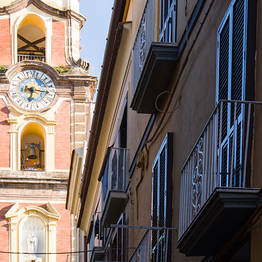 If you would like to take a traditional souvenir from Sorrento home with you, the shops in the center of town are worth a browse. 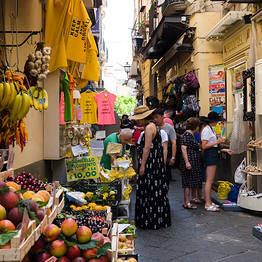 Shop along the main thoroughfare of Corso Italia for clothing and fashion boutiques and the lanes of the historic center like Via San Cesareo and its cross streets for workshops making inlaid wood, leather goods, artisan limoncello, and shops selling local gourmet treats. 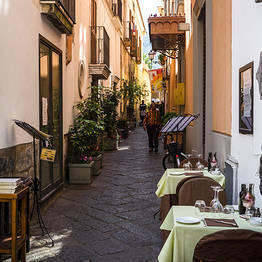 Restaurants, cafes, gelaterias, delis, pastry shops, and wine shops...in Sorrento, there is an unlimited variety of places where you can stop to eat or drink. 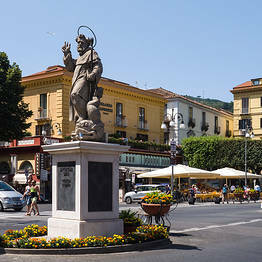 For an espresso or glass of wine, the most popular cafes are those which line Piazza Tasso, the town's main square. Here is where you can while away an hour sipping a drink and people watching. 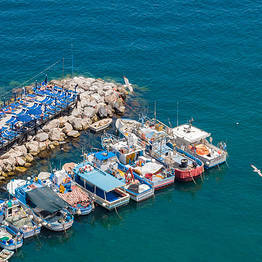 For a fish or seafood dinner, you'll need to head down the to Marina Grande at the bottom of the cliff. 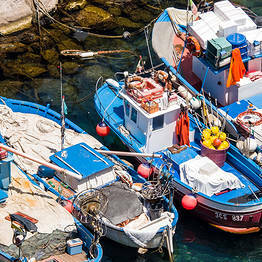 This lovely fishing village on the waterfront has a number of informal and fine dining restaurants overlooking the bay.